My first cover. Whoa. I had no idea how excited I would be! It was a great way to welcome in the Spring season. Coincidentally too, I was asked just a few weeks ago which of my designs is my favorite, and this one fell in the Top 5. I don't know how other designers feel, but when it comes to naming favorites, it's never all about the end product. I love this sweater, and since the process is fairly long, there are so many factors involved. But some designs come together smoothly, without drama, and with just enough effort. Some, on the other hand, seem to come together with the help of everyone you know, a bulldozer, a time machine and a lot of praying and cursing. No matter how those turn out, they're never a favorite of mine. Even if I'm happy with the final piece and it sells well. Like a best friend, I never forget and the pains and abuse hit me every time I see the design. But this Diamond Funnelneck walked straight through the process with a chin up and a straight back. Never veering off into "Gauge is a Liar" land, or "This Looked Better in My Head" land, or "If I Rip This Back One More Time The Yarn Will Disintegrate" land. From working with Interweave, to sitting down and knitting on it every night until it was done, it was a happy knit. It made no fuss, and I became happier and happier with it as I went along. I try to be careful about pairing up the stitch pattern, silhouette, yarn and color. They should compliment and not fight one another. And when I swatched this from Barbara Walker's "A Treasury of Kniting Patterns", I was surprised at how much I liked it. The slipped stitch pattern was really fun to knit, and Quince's Chickadee yarn really made the lines crisp and clean. 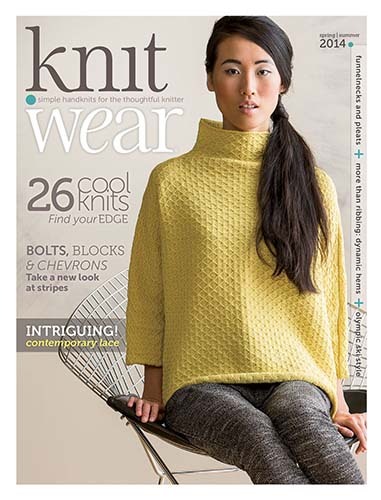 One of knit.wear's stories for this issue was for funnelnecks. I had never done one before, so I really wanted to try it out. The funnelneck is so clean and simple that it seemed to make sense to put the diamond pattern all over, and create a dolman silhouette - two simple pieces, increased and decreased for the sleeves and funnelneck. And, I love using a stitch pattern all over. Contrary to what one might think, it actually makes it fall to the background. Whenever I place a panel or strategically place a stitch pattern it immediately brings it to the forefront; it becomes decorative. So in keeping with the clean lines and simplicity of the diamonds, I liked using it all over with the geometric shape of the dolman.